With a Gothic cathedral that dates back more than 800 years, venerable Champagne caves, playful Art Deco style, and vibrant pedestrian zone, Reims is intoxicating. 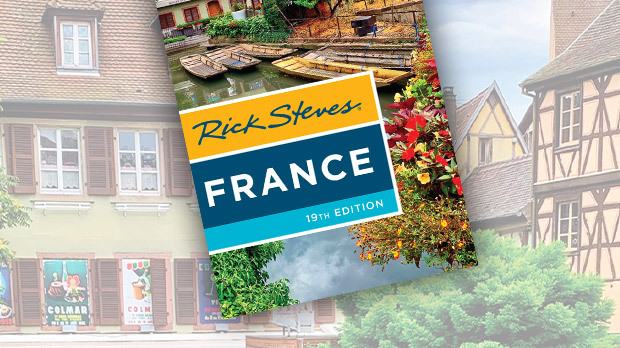 And thanks to France's slick high-speed train network, it's just 45 minutes from Paris — making it an easy day trip. Reims (pronounced like "rance") has a turbulent history: This is where French kings were crowned, where Champagne first bubbled, where WWI devastation met miraculous reconstruction, and where the Germans officially surrendered in 1945, bringing World War II to a close in Europe. The town's sights give you an informative, entertaining peek at the entire story. 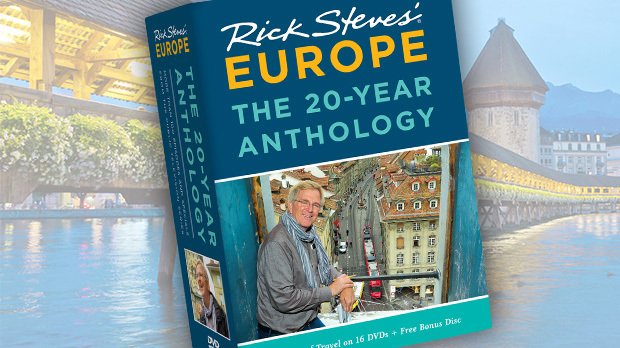 Start at Reims Cathedral — a glorious example of Gothic architecture and one of Europe's greatest churches. Built under the direction of four different architects, the church was started in about 1211 and mostly finished just 60 years later. Thanks to this quick turnaround, it's remarkable for its unity and harmony. As a royal coronation site, it is to France what Westminster Abbey is to England. For a memorable experience, join the crowd in front of the cathedral for a free, 25-minute sound-and-light show on most summer evenings. I've struggled with the idea that some of Europe's wonderful Gothic church facades were boldly painted in the 13th and 14th centuries. 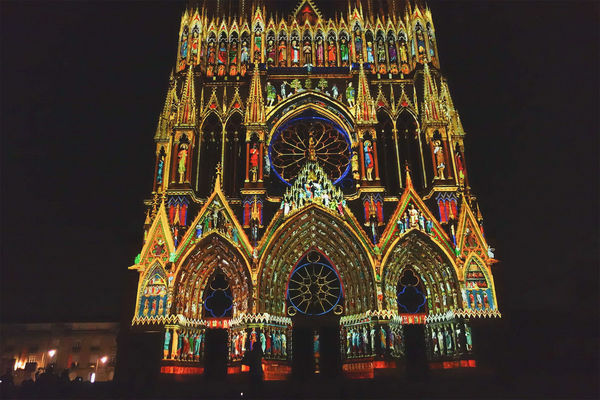 In Reims, the sound-and-light show did a good job of helping me envision how they might have looked to a medieval peasant. Sit directly in front of the cathedral or settle more comfortably into a seat at a café with a clear view past the trees. When wonderstruck by Gothic cathedrals, I often contemplate the lives of the people who built these huge buildings back in the 13th century. Construction on a scale like this required a community effort: It was all hands on deck. Most townsfolk who participated donated their money or their labor knowing that they would likely never see it completed — such was their pride, faith, and dedication. Master masons supervised, while the average Jean-Claude did much of the sweaty work. Labor was something that even the poorest medieval peasant could donate generously. In addition to spiritual nourishment, Reims offers a more earthly delight — Champagne. Though many wine-growing regions in France produce sparkling wines, only the bubbly beverage from this region can be called Champagne. While the ancient Romans planted the first grapes here, Champagne was not "invented" until the late 17th century, and then it was by virtue of necessity — the local climate and soil did not produce competitive still wines. According to the story, in about 1700, after much fiddling with double fermentation, it was in nearby Hautvillers that Dom Pérignon stumbled onto the bubbly treat. On that happy day, he ran through the abbey, shouting, "Brothers, come quickly…I'm drinking stars!" Today the result is commonly regarded as the finest sparkling wine in the world. 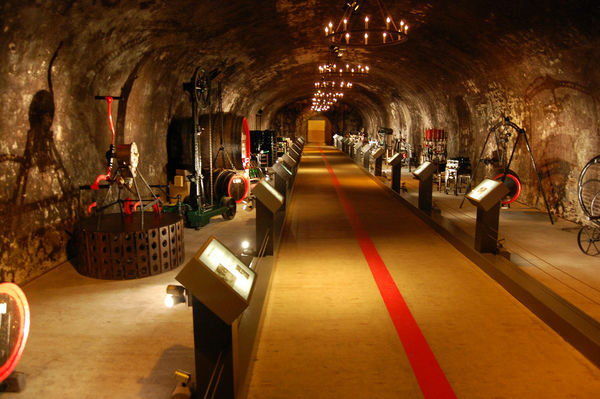 Reims offers many opportunities to visit its world-famous Champagne cellars. All charge entry fees, most have a several daily English tours, and most require a reservation (only Taittinger allows drop-in visits). Which should you visit? Martel offers the most personal and best-value tour. Taittinger and Mumm have the most impressive cellars (Mumm is also close to the city center, and offers one of the best cave tours). Veuve Clicquot is popular with Americans and fills up weeks in advance. (Cazanove is closest to the train station and the cheapest, but you get what you pay for.) Wherever you go, bring a sweater, even in summer, as the caves are cool and clammy. If you find yourself strolling across town to a Champagne cellar, keep an eye open for biscuits roses — light, rose-colored egg-and-sugar cookies that have been made here since 1756. They're the locals' favorite munchie to accompany a glass of Champagne — you're supposed to dunk them, but I like them dry (many places that sell these treats offer free samples). Allies surely celebrated with Champagne on May 7, 1945, after Germans signed the document of surrender for all German forces. WWII buffs enjoy visiting the Museum of the Surrender (Musée de la Reddition), the place where it happened. The news was announced the next day, turning May 8 into Victory in Europe (V-E) Day. The museum has an extensive collection of artifacts, but the most thrilling sight is the war room, where Eisenhower managed Allied operations — and where the European part of the war ultimately ended. Though World War II left the city unscathed, World War I had devastated Reims. It was the biggest city on France's Western Front, and it was hammered — around 65 percent of Reims was destroyed by shelling. Parts of the city center were entirely rebuilt in the 1920s. That's why the town is now dotted with the stylized features — geometric reliefs, motifs in ironwork, rounded corners, and simple concrete elegance — of Art Deco. If it looks eclectic, that's because the mayor at the time said to build any way you like — just build. With all this history packed into a vibrant cityscape, Reims feels both historic and youthful at the same time. Each visit here reminds me of how much fun it is to enjoy modern French culture in a sizeable city that isn't Paris.